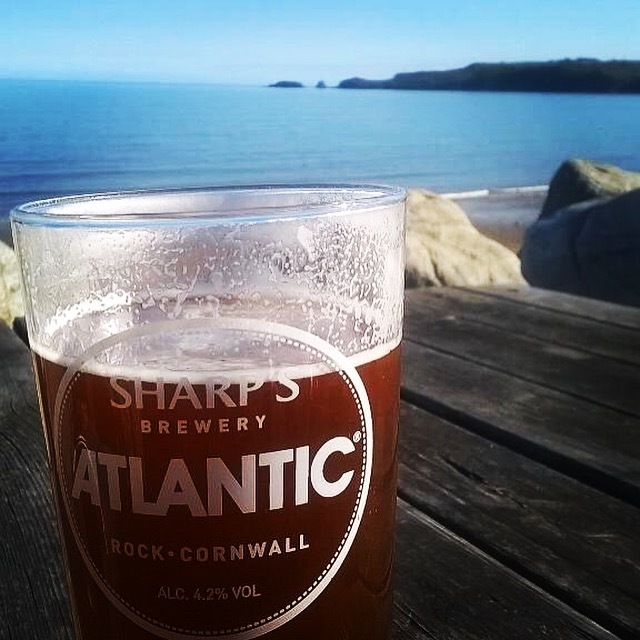 Last month we jetted off to Cornwall for a “Sharp’s Adventure” weekend with Sharp’s Brewery. Alongside five other lucky couples, we were invited to join Sharp’s Brewery and Chef Nathan Outlaw for a food and drink adventure. The details were sketchy, but we knew not to have a big breakfast and to wear good stout shoes. Throw in a two night stay in a gorgeous 4 star hotel and the weekend had me written all over it! We flew from Manchester to Newquay Airport on Friday morning, taking a taxi from the Airport to the hotel we had the chance to take in some of the lush Cornish countryside. We checked into the St Moritz Hotel, Trebetherick, Wadebridge, quickly unpacked and I headed to the spa for the afternoon. Himself took the complimentary Land Rover taxi down to Rock to explore, before joining me in the spa. It’s a hard life. That night we had dinner and drinks in the very fine restaurant at the hotel, before retiring and having the best night sleep we’d had in a long time. The next morning we were up and ready for adventure, whatever that adventure was. We met the other couples in the hotel reception and in small groups we were taken down to Rock for a tour of the Rock Shellfish Company. Luke Marshall whose family have farmed oysters of the Camel Estuary for years gave us a tour, showing us the oysters in their mesh nets on trestle tables out in the estuary. The Porthilly Oysters are delicious and they are in high demand, especially from local chefs. Luke showed us around the building where the oysters are purified in tanks before being sold on to wholesalers and restaurants. We also got a chance to taste these delicious molluscs, a rare treat to be able to try an oyster so fresh and pure. It was not an experience everyone relished, with several members of the group declining the chance to give them a try. We were then given the directions to The Mariners Public House in Rock for lunch. The Mariners is a pub run by both Sharp’s Brewery and Nathan Outlaw and they champion seasonal local food, as well as serving a wide and glorious selection of Sharp’s beers. Lunch was excellent, if a little rushed, we had a minibus waiting outside ready to take us on our next adventure. All of the plates were as pretty as a picture and each item on the menu was listed with a matched beer. Had I had the afternoon free to imbibe, I would have thoroughly explored this option. Starters at The Mariners included pea and ham hock soup and Cropwell Bishop blue cheese salad with chicory and walnut. The most popular main on the table was the breaded hake with tartare sauce and romaine salad – a thick fillet of hake served with bitter romaine offset with a zingy and well executed tartare. Pudding, not that we had much room left, was a choice between steamed treacle and ginger sponge with custard or St. Clements posset, granita and shortbread. I opted for the steamed sponge, I’m a slave to my school dinner cravings, but the pudding was as light and fluffy as it was possible to be. Comforting enough to induce a little nap on the minibus to our next destination. From Rock, the minibus sped us an hour and a half down the coast to our next and final destination, a field somewhere on the Zennon Peninsula where chef Nathan Outlaw was busy with a barbecue, some tables had been beautifully set and ominously a row of hard hats and harnesses lay on the floor. Regrettably my bad back meant I had to stay at the top of the hill drinking beer and watching Nathan Outlaw cook for us, but my intrepid husband donned a hard hat and had a go at abseiling with the rest of the group under the expert guidance of The Newquay Activity Centre. I was sad to miss out on that particular adventure, but up at the top of the hill we were having a bovine adventure of our own. As Nathan and the other chefs were preparing our meal, a herd of cows wandered into the field to check out what we were up to. They were pretty friendly cows and needed to be gently persuaded to leave our al fresco set up alone. Thankfully they did, and most of the cows had moved on by the time everyone was back up after their abseiling adventure. Given that dinner was prepared almost entirely using two small barbecues and on a slightly wobbly table in a field, Nathan had prepared a real seafood feast for us all. Watching him grill flatbreads, pineapple, monkfish, prawns, scallops and an array of vegetables for our barbecue banquet was a bit of a privilege for a foodie like me. Our seafood feast began with smoked mackerel and seaweed pate; seafood ceviche (barbecued brill, prawns, scallops and lobster) with tomato, red onion and coriander; and a barbecued octopus salad with tomatoes, watercress and cucumber, all served with flatbread. The main course was barbecued monkfish which had been marinaded in potted shrimp spice and served with crushed new potatoes, grilled fennel and capers. Dessert was barbecued pineapple with meringue, spiced rum syrup and lime cream. It was all delicious and it was a real privilege to be cooked such a personal and exceptional meal by Nathan. Dinner was matched with beers from Sharp’s Brewery. Favourites included their biggest selling beer, Doom Bar, their new-ish Pilsner and my new favourite, Atlantic Pale Ale – a fruity ale packed with citrus flavours and sweet notes which worked exceptionally well with the seafood. Sadly our Sharp’s adventure was drawing to a close, all twelve of us clamoured onto the minibus back to the hotel, tired but very, very happy. We’d eaten incredibly well, we’d drunk many excellent beers and discovered a few new ones, and we’d had a real Sharp’s adventure. Sharp’s Brewery had treated us to a once in a lifetime, money can’t buy experience, and I think we were all sad it was over. Thank you to Sharp’s Brewery and the St Moritz Hotel, The Rock Shellfish Company, The Mariners Pub, The Newquay Activity Centre and Nathan Outlaw for showing us a good time and for making our Sharp’s Adventure an incredibly memorable one! As a family we were confirmed holiday cottage enthusiasts. The thought of being subject to strict meal times and the rules of a hotel didn’t really appeal. We’ve always enjoyed our own space and the freedom a holiday cottage in the UK has allowed us. We never, ever thought we’d find ourselves on a plane heading to Majorca to stay in a hotel. But one week abroad has completely changed our pre-conceptions, and our holiday horizons have been well and truly broadened. Over the October half term we flew via Jet2 from Manchester to Majorca, for a week in the sun at the 4 star Sol Katmandu Hotel in Magaluf. On paper it was the polar opposite of every holiday we’ve ever had. But we discovered that sometimes doing something completely different is exactly the right thing to do. We arrived at the Sol Katmandu after an early morning flight from Manchester. The hotel reception was busy but we checked in after a fashion and we found our way to our room. The room was clean, well decorated, it had a little fridge, free WIFI, a TV with a couple of English kids TV channels and a rather lovely bathroom. What it didn’t have was a balcony you could sit out on, something we really wanted. Probably about two thirds of the rooms had balconies, so this would be something I’d make sure I had in future. The Sol Katmandu is set in an aquatic theme park and the amenities include a buffet restaurant, 2 bars, 3 outdoor pools and a sunbathing terrace. The hotel offers complimentary passes to the Katmandu Park’s amusement park, a kids’ club and nightly live entertainment. We were staying on a half board basis, which meant we had breakfast and dinner in the hotel. Lunch and drinks were extra, but we found that half board suited us. We weren’t completely tied to the hotel and it mean’t we explored the local cafes and bars in the area. For me breakfast was the highlight of my foodie day. There was a very extensive breakfast buffet including a wall of fruit, continental options, English breakfast, Spanish breakfast, yoghurt, unlimited tea, coffee and juice as well as a pancake and fried egg bar where you watched your pancakes being made. We all fell into our own pattern, the small boy would have scrambled eggs and sausages followed by a pancake with chocolate sauce. My husband would start with fruit and then go for a selection of English breakfast items and I would have a couple of slices of the most delicious tortilla I’ve ever had, usually with some grilled tomatoes, then I’d follow that with pancakes, because the pancakes were excellent. Lunch was usually a casual affair, we’d pop to the nearby Aldi for bread and cheese, or go to a local cafe and have a sandwich or share a pizza. We never really felt like eating much after our big breakfast. Dinner in the hotel was another buffet style feast. I’m a vegetarian and I did find my options were a bit limited, but there were always a few veggie dishes to choose from. They also had child friendly options such as fish fingers and chips, though the boy liked to choose his own and often went more exotic dishes. Hubs was in his element at dinner, there was a grill where chefs cooked to order fish and meat such as lamb chops and steak, and there was more often than not a paella available. The salad bar was excellent, I liked to fill up on salad and have a little plate of other bits and pieces before launching myself at the desserts. The dessert selection was excellent, there were individual tubs of ice cream and beautiful jewel coloured cakes and treats, as well as cheese and biscuits. Being half board we had to pay extra for our drinks, but we were content to have a drink or two in the bar after dinner, so the drinks bill did not add up. Tip: If you like sangria, the sangria in the pool bar is made from scratch and is delicious, whereas the sangria in the hotel bar inside is ready mixed and not quite as good. The Sol Katmandu has a holiday club for little ones each day and they all seem to have a really good time. Lots of dressing up and doing fun activities. The boy went for a superhero morning and made his own cape. He had a great time. The kids club is included in the price of the hotel and it’s well worth looking at if you fancy a couple of peaceful hours to yourself. In the evenings there was entertainment, but we didn’t really go to this, we preferred to go back to our room, wind down and have an early night. The Sol Katmandu has three swimming pools. One small splash pool, one deeper round pool and one longer pool. None of them are heated, so it is a bit bracing if you dive in and you’re not expecting it. But after an afternoon in the sun, the cool water of the pool is exactly what you need to come back to a normal temperature. For us the pools were a big draw. Each day we’d ask the boy what he wanted to do, and all he wanted to do was play in the pool, so that’s more or less what we did. The local shops sell inflatables and water guns, and all the little boys seemed to have them, so their days were filled with water fights and lots of laughter. Like most hotels there was a big of a culture of claiming a sun lounger with a towel, which meant that most of the well positioned loungers were reserved for invisible people for large portions of the day. Despite this, we managed to spend most of our days lounging by the pool, relaxing and reading, going for a quick dip and just chilling out. It was bliss. One of the biggest selling points of this hotel is the amusement park attached to it. As a resident of the hotel you get a free play pass which gets you into the park and entry to the attractions (though terms and conditions apply etc). The Katmandu Park has two excellent crazy golf courses – probably the best I’ve seen, and most days we played a round of golf after breakfast before heading out for the day or settling down round the pool. There is the “Upside Down House” where everything is a crazy optical illusion. I would have liked to have spent longer exploring the house but the boy was a bit freaked out by it. So we rushed through it, which was a shame. There’s also the Katlantis Splash Park which looked great, but was closed as October is the end of season for the resort. There is also a 4D cinema and various interactive games, rides and a soft play centre, most of which are indoors. There’s also a bar where you can grab a snack and a drink. During the week we were there, the park wasn’t too busy and we only had to queue a few minutes for things. I liked the park and would like to have explored it more and taken more time over things, but the small boy was a bit freaked out by the house (in fairness he was a bit poorly that day and out of sorts) so we just stuck to the crazy golf. I think the Katmandu Park is great, and if you’ve got lively kids its a great way for them to burn off some excess energy. Quite a lot of the attractions are indoors, so if you’re wanting to shelter from the sun for an hour, then the park is a good option for that too. We were staying at the hotel during the October half term, the week before Halloween. The Sol Katmandu goes all out for Halloween and even has it’s own hashtag. The hotel and park were gloriously decorated, even the beds had a Halloween bedspread on them! At dinner on the last night all the staff were dressed up with Halloween headgear and most of the desserts had wriggly jelly worms on them, or creepy spiders – the amount of effort they put in was well worth it. I loved it. The hotel has a Steampunk vibe anyway and lends itself to being decorated up for an occasion. This was our first family holiday abroad and it smashed a lot of our preconceptions about that kind of holiday. ♥ We really liked being able to properly relax and have someone else cook and clean for us while we were away. ♥ The pools were great. They were clean and a life guard was around at all times. ♥ The Katmandu Park is a great addition and we spent about an hour a day in the park. The play pass is free and there are some really fun things to do in the park. ♥ Going half board gave us the best of both worlds – we could eat breakfast and dinner in the hotel, but we could also go out, explore and have lunch. ♥ October was a great time to go abroad for us, it was still hot and sunny during the day, but it wasn’t uncomfortably hot. Magaluf was fairly quiet and felt like more of a family resort than a party destination at that time of the year. Our week at the Sol Katmandu was a real game changer for us. We now understand just how fantastically relaxing these kinds of holidays are. Whilst there’s still room in our lives for our self catering holiday cottage breaks, I think having a gloriously relaxing holiday where someone else cooks and cleans for you, where you can sit and relax for hours by the pool and everyone’s batteries recharge. We really liked the hotel. It was clean and comfortable, the facilities were great, the food was good and the pools were a huge hit. We came home with big smiles on our faces, we just need to decide where to go next. We were invited guests of The Sol Katmandu and Jet2 Holidays. All images and opinions are our own and this is a true reflection of our experience. Being self-employed has its ups and downs. I am my own boss and I answer to no-one, but on the flip side I am totally responsible for everything at work. If I ever think about taking a sickie, the boss knows about it straight away. Because I work for myself, I’ve had to work some long hours recently to get things ship shape before our first family holiday abroad. Over the October Half Term we packed our bags and went on a family holiday to Majorca courtesy of Jet2. It was eagerly anticipated, especially by the little fella as it was going to be his first time on a plane. On departure day we woke early at 4am as the flight was due to depart at 6.30am. We jumped in a taxi and headed off to the airport. The check in at the airport and passing through security was a doddle and soon we were relaxing in the departure lounge with a coffee and sausage butty. We didn’t have long to wait before our flight was called and we made our way to the gate and boarded the plane. I did wonder at this point if the little fella would be a bit scared by it all, but he was happy as Larry and took it all in his stride. He loved the flight, especially the take off, and soon we were landing in Majorca which again put a big smile on his face. The transfer to the hotel was a breeze. We were staying at the 4* the Sol Kathmandu in Magaluf. The hotel was excellent, our only quibble was the lack of a balcony which we could sit out on, but I think everyone will always find something not to their satisfaction. After we’d unpacked in our room, the lad wanted to go exploring as he’d seen the three outdoor swimming pools on our way into the hotel and couldn’t wait to get in the water, and his dad couldn’t wait to get on a sun lounger. If you want to know what we did on our holiday, most of our days were spent relaxing by the pools; sometimes all of us splashing about in the water, sometimes Ben in the water with the new friends he’d made, while his parents topped up their tans, read their books and had a glass of sangria or two. Twenty-four hours into the holiday, both my better half and I said that we definitely more relaxed in a hotel abroad than on our usual holidays in Devon. We usually go self-catering and in Devon we are the small boy’s only source of entertainment. It was so nice to be away and to only have to think about when next to apply sun cream and not about the stresses of work, if only for a week. It was nice to spend time with my family, especially the missus, instead of rushing around badgering the boy to get dressed, or going back to work in the evenings to catch up with stuff. Here’s to our next holiday abroad, which hopefully won’t be too far away. Thank you to the Sol Katmandu for putting up with us and Jet2 for getting us there and back safely and efficiently. If you’re off on a day out, or you’ve got tickets to a family festival or event, it makes sense to plan ahead and prepare yourself for all eventualities. In the UK “all eventualities” essentially means prepare yourself for the weather, all of the weather. We live in Manchester, which is not known as the rainy city for nothing (though it doesn’t actually rain as much as you’d think). We try to get out and about as much as we can, which often means standing in a muddy field getting rained on, but still managing to squeeze some fun out of our precious family time together. Here are my tips for surviving and enjoying outdoor events in the UK. Check the weather forecast. This will give you a vague idea of what the weather is likely to do on the day of the event or festival. Although if it says it’ll be sunny I’d still stick a brolly in the car just in case. Pack a Picnic. Regardless of whether the event has food on offer or not, I always pack some emergency provisions. At the very least a couple of bottles of water and enough snacks to tide a hungry tum over until a pulled pork burger can be foraged from the nearest street food vendor. Plan your day. Check out what’s on, what time it’s on and where it is. If there’s something you especially want to see or do, then it helps to know where on the festival site it’s happening and when. It’s often worth printing out a little map of the site and an events listing, or taking a screenshot on your phone to refer to if you need to. Take something to sit on. Festivals, events and days out can be a loooong day and you can guarantee there won’t be enough seating for everyone. Take something to sit on. A picnic blanket with a waterproof backing is invaluable, but if you don’t want to carry that around, a bin bag for each family member to sit on works just as well and is much lighter and easier to carry. I have a bad back so can’t sit on the floor, so I take a little camping chair to sit on and my son often climbs on my knee for a cuddle. I wouldn’t be without my chair. Wear suitable clothing. Rain or shine if you get a couple of thousand people in a field you will need to wear wellies or good stout walking boots. If driving rain is predicted and you’re still going to the event, then pack a mac and wear waterproof clothing. Be prepared to get wet and have dry clothes waiting in the car. Take a change of clothes. If you’re going in your car it’s easy to pack a change of clothing and leave that and a cosy blanket in the car. My son always snuggles under a blanket on the way home and we wouldn’t be without it. The thought of being able to change at the car if you need to can get you through an afternoon of dampness. If you can’t take a change of clothes (including dry socks and shoes) to change into for the drive home, then I’d recommend packing a pair of dry socks sealed in a plastic bag. Dry feet can make the difference between abject misery and a tolerable bus ride home. Bring a brolly. We keep a big golfing umbrella in the car as well as a small one to slip into my bag. When we arrive at the festival we make the choice which, if any to bring with us. If it’s raining then the golfing umbrella, especially when teamed with my camping chair makes a nice little shelter from the rain, and when it’s very sunny the brolly offers a little shade. Use sun cream. Even if it’s cloudy in the UK, you can catch the sun by standing in a field all day. Slap on the factor 30 and top up regularly. Wear a sun hat and keep hydrated. Bring some baby wipes. As a parent I’m never more than 2 metres away from a pack of baby wipes, they are an everyday essential and invaluable at events and festivals. From cleaning sticky fingers before lunch, dealing with the worst of the mud, for toilet times and for making yourself presentable for the journey home. We don’t leave home without them. Take cash money. Festivals and events can very easily be done on a budget, but once you’re in you’ll have to buy everything you need and it probably comes at a premium. We tend to pack a picnic and then buy some treats like ice cream when we’re there. Just don’t turn up thinking you can pay for everything with your card, cash is king and most events don’t have ATMs on site. If you’re prepared for the changeable and sometimes really miserable UK weather, you’ve thought about food, transport and you’ve planned your day then hopefully your family day out will go off without a hitch. Maybe I’m a bit odd, but I’ve started to have low expectations of what an event or festival will be like before I get there, that way I’m rarely disappointed and often surprised and enchanted by what happens on the day. I have a bit of a go with the flow attitude to life and almost everything I do, which does mean that you can sometimes find me dancing in the rain. You can’t control the weather, but you can control how you prepare to spend a day in that weather. Come rain or shine you will find us having fun in a field somewhere this summer and I hope you won’t let a little rain stop play either. Do you have any top tips for surviving family festivals and events? As a slightly less able person (spinal injury, nerve damage, chronic pain), I need to pace myself and rest more often than I would normally. I have adapted my day to day life so that I’m able to manage myself properly, take my medication when I need to, rest and exercise appropriately and generally maximise my wellness. But holidays throw that tried and tested routine out of the window leaving me in more pain, more tired and out of my medication routine. We are on holiday in North Devon. It’s one of our favourite places to visit and we come back year after year. But from Manchester it’s a minimum 5 hour journey. This time it took 6 hours, but it has taken 8 hours in bad traffic. Sitting in one position for 6-8 hours is bad for anyone, but with my ruined spine it gets very uncomfortable, then very painful and it takes days to recover from. Once we get there, put me in an unfamiliar bed and I’m gobbling painkillers like they’re smarties. Combine that with a lack of routine, longer than usual walks which are usually on the beach on sand, shale or pebbles which are hard to walk on its all a bit ouchy. At home I can plan my week, if I’ve got an active day then I’ll make sure I’ve got a rest day after it. On holiday every day is an active day. So what do my holidays look like? My holidays look like car parks. I often have to just sit in the car and rest while my painkillers kick in and the boys race off to do their thing. It makes me a bit sad that I can’t fully participate in holiday activities, but then I can’t always participate in normal life activities either. Stop moaning kid, these are the cards you’ve been dealt. Live with it. Reading this back it makes me wonder why I bother going on a UK holiday at all. But it’s beautiful here and although I’m half cut on prescription painkillers most of the time, it’s nice to spend time with the boys, to get some sunshine and sea air and to take the boys out of their routine for a while. It’s hard enough being me and living with my limitations, it must be equally hard for them, so they deserve a holiday and a chance to relax and be free from my routine for a week or two. North Devon: so beautiful, but you can only access this beach via a cliff path. On Saturday I was invited to the Jet2Sunchester blogger event run by Jet2Holidays. It was a showcase of some of their hottest summer destinations including Majorca, Malta and Tenerife and an afternoon of food, cocktails, glitter, sunshine and palm trees and catching up with some friends. Oh and I won a holiday, but more of that later. We were invited to dress for summer but the Manchester weather hadn’t got the memo so was treating us to a day of wind and rain. However the sun shone inside and the Jet2 team had decked the room out with palm trees, deckchairs and a mini golf course. Around the room four holiday resorts had set up stalls and in one (very popular) corner you could get your nails done and have a massage. The Sol Katmandu Park & Resort in Majorca. It’s a new 4* family hotel set in an aquatic theme park, this vibrant hotel is a 5-minute walk from the beach. The Sol Katmandu Park & Resort is full of fun family things to do, including 3 pools, water slides, a soft play area, a 4D cinema and access to the theme park. It looks and sounds like the most fun family holiday destination in the world. BH Mallorca was launched 2015 and has taken the holiday clubbing world by storm. The hotel guarantees a superstar DJs, stunning accommodation and the world’s first over 18s waterpark full of high adrenaline thrills. It’s the prefect party hotel. Hotel Botanico and The Oriental Spa Garden in Tenerife looked and sounded like heaven. This 5 star luxury hotel combines luxurious accommodation, fine dining restaurants and leisure facilities, including the award-winning Oriental Spa Garden. It’s a beautiful looking hotel and I can’t think of a more stunning location for a spa. Lastly there was Malta & Gozo – Malta has a rich history and lots to recommend it. It has almost year-round sun, 9 UNESCO sites – ancient temples, Roman ruins and medieval cities as well as beautiful coastlines and lively resorts sporting a mixture of old town charm and modern day attractions with a range of accommodation to suit everyone. Tour of the Mediterranean over, I decided it was time to hit the cocktail bar, grab myself a still smoking and bubbling cocktail (it’s alive I tell you!) and go and get my nails done. After that there was no stopping me, I had an amazing massage (seriously Jet2, can I have her number?) and then got my face glittered, because it’s nice to shimmer sometimes. The afternoon was drawing to a close, I was tired and ready to go home and wistfully flick through some holiday brochures. It was time for the prize draw and everyone gathered round waiting to hear who’d won the holiday. I never win anything so I hung back playing it cool (think Del Boy and Trigger at the bar) when my name was called out and I nearly fell off my deckchair in shock. I had no words, I couldn’t speak and I was beyond delighted and excited and giddy, and, and, and completely lost for words. I’m so excited about being able to take my son on his first foreign holiday and on his first plane journey, there will be so many firsts for him and I can’t wait to share that all with him. Thank you to Jet2 and to The Sol Kathmandu Park & Resort for our prize, we are so looking forward to our visit to Majorca and I’m looking forward to sharing our experience with you on my blog. You’ve got to be in it to win it or something like that. A straw poll of my friends tells me that most of them will be taking a family holiday this year. During the winter months, I can’t think of a better time of the year to jet off for a winter sun break; warm your bones and enjoy some time away from the hectic festivities. A summer family holiday can come in all shapes and sizes. We like to hire a cottage in Cornwall for a few weeks, or hop on a plane for some guaranteed sunshine. Sadly, I often think that trying to grab a break away with the family can feel like more trouble than it’s worth. By the time I’ve done all the washing and sorted out all the things you need to pack, I’m almost entirely fed up with the idea of going away. Whether you’re going near or far, here are my top tips for packing and also keeping your kids entertained on planes, trains and automobiles. 1. Keep a packing list on your computer, the things you always need to take, clothes, underwear, hairbrush etc. print it off and use it each time you go away as a check-list. 2. Travel light, or as light as you can. If there is a washing machine available you can plan to do a wash or two while you’re away. Yes it’s a domestic chore but I’d rather wash than pack half of my wardrobe. 3. Check the weather forecast before you go, it won’t be 100% accurate, but you’ll have an idea of what kind of weather to expect and consequently what kind of clothes you’ll need to pack. 4. Wherever you go in the world they will most likely have shops there. So it’s not the end of the world if you forget to pack toothpaste! 5. Don’t forget to bring a few of your child’s favourite things to help them settle. A book, a toy, a puzzle and their favourite snuggly for bedtime! If you’re in your own car then it’s often easier. You have your own space and you don’t have to worry so much about disturbing other passengers. We’re big fans of audiobooks and CDs for the car so we can have a family sing along. Planning a “spotting game” is always good. Ticking off when you see a bus, a lorry, a smoking chimney, that kind of thing. When all of your efforts are exhausted, we break out the portable DVD player. Nearly 2 hours of battery life and a pair of headphones are enough to restore tranquillity to the car. Trains and planes are good for quiet games, such as the Shopping List game from Orchard Toys, Dobble or even Snap! If the kids are old enough some quiet time reading their favourite book can be good. Whilst we do try and generally limit screentime; playing a game on a tablet, smartphone or hand-held gaming device could be a good way to wile away a bit of a long journey. Plus it will give you a break from endless games of I-Spy and Snap! Travel is always a great learning experience for children no matter what age they are. Talking to them about where you are going and why, as well as what you might see or do there. Getting the kids involved and invested in the planning of day trips and things to do whilst you are there is a great idea. It can help minimise whining if they’ve had to plan it. Showing them pictures of the famous landmarks in the area and maps of where you are going is good fun. Talking about currency and what the exchange rate is are all fantastic things to do. These not only get them prepared for their holiday but can also help to develop a whole range of skills and knowledge for later on. Are you going away this year? What are your plans? What are your family holiday packing essentials? In May this year we were lucky enough to go to Bluestone Wales for a break (Monday 11th May – Friday 15th May). We were delighted to be selected as ‘Bluestone Bloggers’ and offered a break to review. We loved our time in Pembrokeshire and were sad to leave, here’s what we thought of Bluestone Wales. We live in South Manchester and drive down to Devon and Cornwall several times a year, we are not strangers to a long journey and this took around 6 hours. It was a bit of a schlep and I’d be unwilling to drive all that way for a night or two, but for a Monday-Friday break it was tolerable. We drove over the Severn Bridge into Wales and I’ve put a clip on YouTube of the crossing. As long as you’re prepared for the journey with activities, drinks and snacks you’ll survive. Bluestone Wales was pretty easy to find, following the brown road signs we got there without getting horribly lost. We drove up the long driveway and up to the welcome gate, there was no queue (it was around 6pm) and we were given our lodge keys and welcome information pack and we drove straight to our lodge, unpacked the car and took the car back to the car park. We found check in really quick, simple and efficient. Though I think there might be queues if you arrived at peak time. We were allocated a ‘Ramsey Lodge’ which sleeps four people and has two en suite bathrooms. The bedrooms and bathrooms are downstairs and the living areas are upstairs, which makes the most of the stunning views at Bluestone. The living area had a well equipped kitchen, dining area and lounge area, all open plan, all modern and stylishly designed. We didn’t spend that much time hanging out at the lodge though, I think I cooked two meals there and everything I needed was available in the kitchen and pretty straightforward to use. We were supplied with a few essentials to help with the washing up. Everything was clean, modern and much nicer than home, sad to say. Downstairs in the bedrooms, the small boy was delighted to have his very own bathroom which was a wet room. His bedroom had two single beds in it which were very comfortable and with really lovely bedding which felt quite luxurious. In the master bedroom there was a comfy double bed, again with the same luxurious feeling bedding and lovely furniture, this room had patio doors which you could open if you wanted, we didn’t because it wasn’t that warm, but it was a nice touch. The en suite had a shower over the bath which I didn’t use. The small boy did as he prefers baths, but we enjoyed the wet room, it was nice to have a choice and with my disability it was easier for me to shower in the wet room. The floor does get slippy, so do take care. The accommodation got a really big thumbs up from us, it was by far one of the best places we’ve stayed. The lodge was far superior to other lodges we’ve stayed in. It was clean and well maintained with everything we needed, apart from a hair dryer, though these are available to hire, but we took our own. Having stayed in similar lodge based holiday villages, we were pleasantly surprised with the layout of the village. We were used to large noisy bio-dome type places; but the Bluestone village was set out like an actual Welsh village, with narrow rambling lanes, shops in traditional looking buildings, with a smattering of places where you could eat and drink. Over the stay we tried a few different places, our favourite was the Knights Tafarn which was a child-friendly pub. The food was hearty and they had a good selection of drinks, as well as colouring activities for the kids. You could sit outside if you wanted, it’s a good spot to sit with a pint while the kids play havoc in the huge playground next door. One night we went to the Farmhouse Grill. We were expecting quite lovely things, the specials board outside listed some great sounding dishes made with local produce, so we booked a table and got a bit dressed up. We were pretty disappointed with the meal, we ordered the kids macaroni cheese which arrived looking good, but when we dug into it there was a thick black solid layer of cheese underneath the top layer, indicating that it was re-heated, which you do kind of expect, but serving a child a thick layer of burnt cheese is disappointing. My meal was ok with the sweet potato fries a highlight, but hubs ordered the fillet of sea bass off the specials menu. He loves eating sea bass fillets and has them all the time, however this was riddled with bones and clearly hadn’t been checked at all before cooking, after three mouthfuls and 8 or more bones he gave up. We complained to the waitress who said it was meant to be full of bones (it wasn’t), so we complained to the manager who didn’t charge us for the sea bass or the kids meal. We left feeling disappointed but I think the manager handled it well, which is all you can ask when mistakes are made. Bluestone is set in a small valley with a lake at the bottom of it. We were very lucky that we were less than 5 minutes walk from the village centre, which meant that the playground, spa, shops and pubs were all within easy reach. Lots of people hired golf buggies to get about in and we did enquire but they were all booked up. I was easily managing about 8k a day and because I’m not great on my feet I was starting to struggle after day 2. The small boy was finding all the walking we did quite hard work too, if we went again we would pre-book a buggy for the duration of the break, but it wasn’t terrible without it. There was a free bus which ran through the village and up to the car park, activity centre and Blue Lagoon. The bus was a godsend and the driver was really lovely. At Bluestone they are busy building some new lodges which they are planning to open this summer. Our lodge backed on to the fenced off building site, which in some ways was brilliant for our digger loving son, especially as there was a viewing platform nearby where you could watch the diggers at work. We were given a call before we went to warn us that building work was taking place so we were prepared for it. I suspect if we had been unhappy we could probably have been moved, but we were fine with it, especially as for most of the time during the day when they were working we were out anyway. I made a little vlog (be gentle, I’m not a natural vlogger) about the building noise at Bluestone Wales. The Blue Lagoon is a fabulous addition to Bluestone, it is open to the general public, but if you go before 11am it is open exclusively for Bluestone holidaymakers. It’s free to use, you just have to flash your lodge key and they issue you with a pass for your stay. It’s a brilliant pool with a wave machine and two water flumes, as well as an outdoor jacuzzi and a lazy river that meanders outside, plus a wet play area for little ones, there’s plenty to enjoy and it’s well worth a visit. The changing areas are good and there is a cafe by the pool where you can grab a drink or a snack. We went every day! The Activity Centre is located at the top of the village. I took the small boy there for a morning and we enjoyed the huge soft play centre, which was free to go in. Later he joined the ‘Bluestone Buccaneers’ where he and his fellow pirates got to dress up and go on a pirate adventure, exploring Bluestone looking for buried treasure. He really, really, really loved being a Bluestone Buccaneer. The activity centre has a good range of activities for children and adults alike, I would have liked to have tried a few more out but there just wasn’t enough time. Both hubs and I managed to separately grab some time in the spa, located in the village centre it was minutes from our lodge. I have devoted an entire blog post to the spa, so you can read more about my experience and thoughts about it here. But yes, in short, I’d move in if they’d let me! The area around Bluestone is absolutely stunningly beautiful, with seriously breathtaking beaches and lots of family activities you can get involved in. Again, I’ve written a separate blog post about what we did while we were in Pembrokeshire which you can read here, but highlights were the stunning beaches of Tenby and Saundersfoot and a rainy day visit to Dylan Thomas Boathouse. Bluestone was hands down the best holiday of that kind we’ve ever been on, and we’ve been on a large number of them. The accommodation, pool, spa and activities were spot on, the village was well designed and the shop was well stocked and the playground was by all accounts lots of fun. The problem with the meal was handled well and the on-site customer service team were lovely and very helpful. What we commented on was that although judging by the full car park the site was obviously very busy, with most of their 300 lodges in occupation, it all felt quite quiet and peaceful which is exactly what you want in a holiday. Overall there were no real negatives about Bluestone, nothing we couldn’t live with and nothing which left us with a bad impression. We’re saving up for a return visit as soon as we can. We have very much fallen for the white sands of Saundersfoot and the calm clean air of Bluestone Wales. Note: We were invited guests of Bluestone Wales and were not asked to pay for our accommodation. All food, activities and travel expenses were covered by us. All images and opinions are our own.